A neater and easier alternative to the KFB increase. The "knit front and back" (KFB) increase is easy to do, but it leaves a tiny bar across the front of the knitting. There are lots of ways to increase that don't leave a bar, but I learned about one recently that surprised me with its simplicity. It's closely related to the KFB, but as well as not leaving the bar, it's also quicker and even easier. 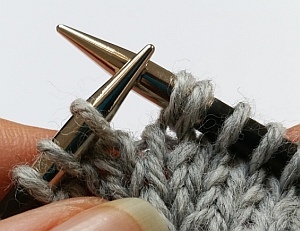 The trick to remove the bar is to knit into the front of the stitch as normal, but then slip the back leg onto the right needle instead of knitting it. I didn't come up with this myself—I saw it on a Ravelry post written by Roxanne from Rox Knits. I tried it out and liked it a lot. The only name I could find online for this stitch is "alternate KFB", but I think it deserves its own name. I've gone for KFSB—"Knit Front Slip Back". 1. Knit the stitch without transferring it to the right needle, and insert the right needle into the back leg as for a KFB. 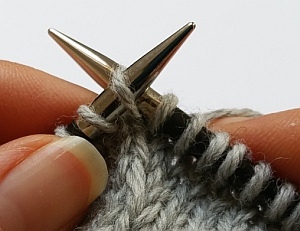 But instead of knitting the back leg, just transfer it directly to the right needle. 2. KFSB complete, and there's no bar! I don't think there is one. You don't need to do anything special when you get to the new stitch on the following row, just knit or purl it as normal. The only time I can think that you wouldn't want to use the KFSB is when the bar from a KFB is used as texture or decoration in the pattern. 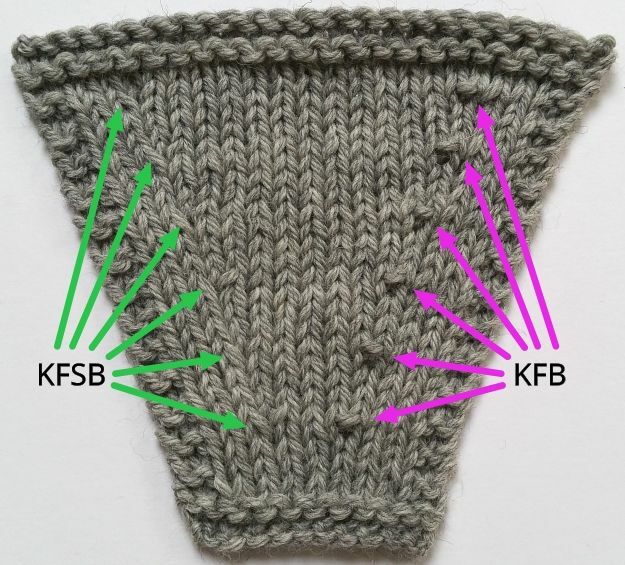 The KFSB isn't completely invisible, but at least your knitting won't be peppered with little dashes! I love that there are so many different ways to do the same basic thing in knitting, each with their own advantages and disadvantages for different situations. I guess the number of options can seem overwhelming though—maybe it's time for a Compendium of Increases to accompany the Compendium of Yarn Joins! Edit—A Knitting Paradise user, Judith, got in touch to say that there's a problem using the KFSB on the first row after a color change. Unfortunately using a KFB doesn't fix the problem either, but the 'Make 1' increase provides a solution.